American artist born in Brooklyn, New York, on July 4, 1889. “Al Zere” (as he is better known), of Alsatian lineage, decided at the age of 12 to be a cartoonist and attended evening art school as a youngster. He later studied at Brooklyn’s Adelphi College Art School and, after World War I, at the Sorbonne. At 15 he made his first sale to Judge and was soon contributing there, to Puck and to the Brooklyn Eagle. For the Eagle, as a staffer, he created the comic strip Buttons and Fatty, which ran for years under a succession of artists, including M.E. Brady. 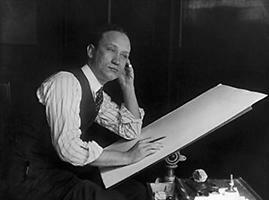 During the war he served as business manager and cartoonist for the American Expeditionary Force magazine The Martian and won awards for his work in its pages and for his posters. In the postwar months he traveled across Europe, sending back sketches to several American magazines. By this time Zere had a mature and breezy style, with lush pen lines delineating character and action. Zere was one of the first cartoonists to mine the rich lode of material in America’s suburban exodus; he also pioneered several “little man” themes, such as the henpecked simp who is married and harried. In the 1920s and 1930s this became a standard device in comics and humorous literature, but Zere masterfully defined the genre in such features as Man the Master, a panel for the Evening Post (which he joined in 1920) and So This Is Married Life, a strip for the New York Journal (which he joined in 1924). He married at this time the daughter of Hearst’s multitalented art editor, Al Biederman. Through the 1920s Zere also drew frequently for Judge and contributed editorial cartoons to labor newspapers. Thereafter he drew various features for smaller syndicates and busied himself with sculpture, at which he was accomplished. (He had spent two years in Africa seeking inspiration for his handsome plaques and busts.) Titles include: Flossie, which ran in 85 newspapers starting in 1935 for the Bell Syndicate; Ella the Maid; Two Orphans; You’ve Got Something There, a Hatlo imitation: and two World War II features – Rookie Joe, a panel for United Feature, and Jerry. Junior Air Warden for Bell. The widowed Ablitzer ended his full career living near the famous Niederstein’s Restaurant in Queens Village, New York, which was operated by his new wife, the former Adelaide Lardon. He died on November 11. 1968. It remains for Zere to be recognized more fully for his liberation of cartoons from stylistic stiffness and for the affirmation of married and suburban themes in the comics. His cartoons and comics stand out even today as fresh, lively treatments of what have become American stereotypes, thanks in part to him.